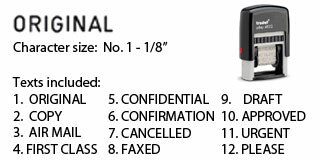 Shiny® S-303, 4-in-1 Mini Self-Inking Dater. Four interchangeable rubber dies come with every dater. The interchangeable rubber dies and the die plate are ribbed so the die is easily removed and replaced. Shiny R-532D Self-Inking Dater-1-1/4 in Dia. Shiny R-542D Self-Inking Dater-1-5/8 in Dia. Shiny R-552D Self-Inking Dater-2 in Dia. Text Plate Size: 3/8" x 1"
Text Plate Size: 3/16" x 1"